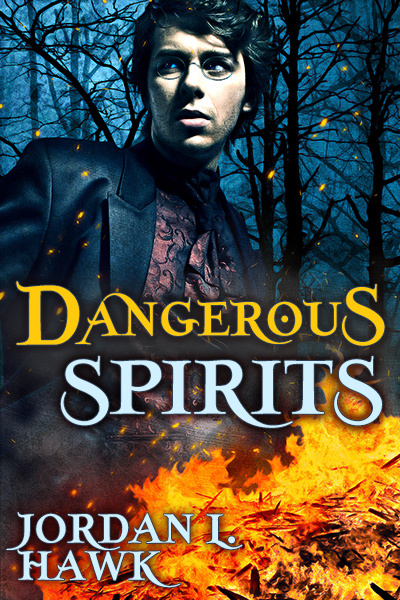 I’m so excited to share the cover for Dangerous Spirits, Book 2 in the Spirits Series! I was terrified of ghosts as a kid, and just as with Restless Spirits, while writing this book I incorporated some of the things that really creeped me out. You can preorder it here, with B&N, iBooks, and Kobo soon to come! After the events of Reyhome Castle, Henry Strauss expected the Psychical Society to embrace his application of science to the study of hauntings. Instead, the society humiliates and blacklists him. His confidence shaken, he can’t bring himself to admit the truth to his lover, the handsome medium Vincent Night. Vincent’s new life in Baltimore with Henry is disrupted when a friend from the past asks for help with a haunting. In the remote town of Devil’s Walk, old ties and new lies threaten to tear the lovers apart, if a fiery spirit bent on vengeance doesn’t put an end to them first. That is GORGEOUS! Off to pre-order now! !